We are grateful for our community, clients, and friends helping us help others in their time of need. We have partnered with 8 Days of Hope to help spread the word and get needed supplies, donations, and volunteers. Hurricane Florence did some major damage to our neighboring cities east of Charlotte, and we are going to do everything we can to help! 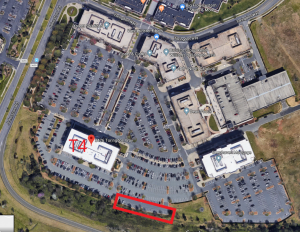 The Donation Trailer will be at our office parking lot and supplies will be taken during business hours Thursday, Sept 20th thru Friday, September 28th at Noon. Special Thanks to Paul Aureliano and Real Steal Auto Sales & Repair for the donated Trailer. We will have people going to New Bern, NC Saturday 29th – October 3rd to assist in any way with 8 Days of Hope. We know you have a Scarlett Heart. Do what you can to help today! 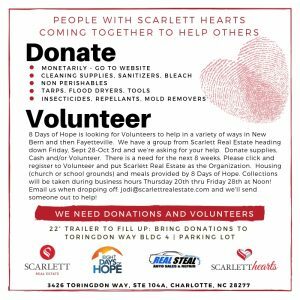 Click here to REGISTER TO VOLUNTEER with SCARLETT REAL ESTATE!